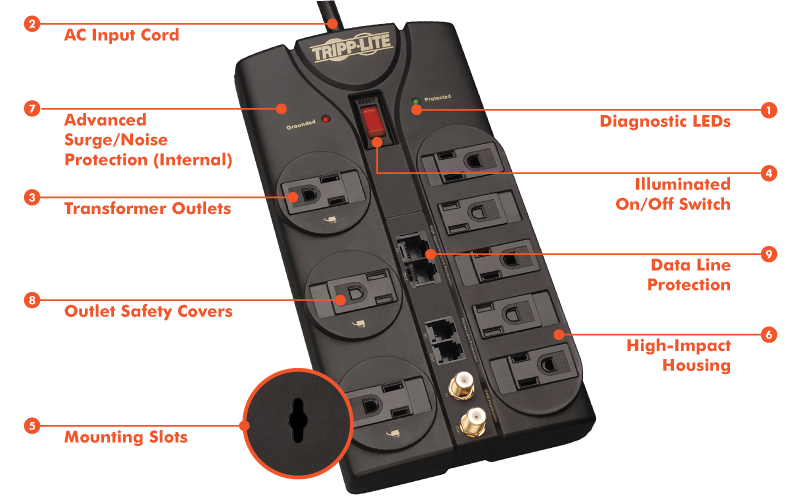 Tripp Lite's TLP810NET surge suppressor has 8 outlets, a 10-ft. cord with a space-saving right-angle plug, and diagnostic LEDs. The unit has a surge suppression rating of 3240 joules to handle the strongest surges. Built-in RJ11, RJ45, and type F coax jacks prevent surges from damaging your modem/fax/10BT/cable/satellite equipment. Coaxial jacks provide digital broadband quality and can handle 2.2GHz bandwidth. 3240-joule surge protection rating – More joules mean more protection!